At a tasting in Boston this summer, a Vermont hard cider inspired a special, $85-per-person dinner at L'Espalier, one of that city's finest restaurants. The same day, another Beantown buyer rushed to grab as much of the cider as he could, never mind the steep price. Created by Shoreham's Shacksbury Cider and dubbed "the 1840," this singular, awe-inspiring cider is made with the juice of abandoned apples. With flowers on the nose and lingering notes of honey musk and finished wood, the Champagne-y quaff is crisp but balanced, with bright, green-apple acidity and delicate complexity on the back end. It's a blend of 35 individual varieties, picked last fall from local pastures, roadsides, forests and meadows. "There are no cultivated apples in the cider at all," says Shacksbury cofounder David Dolginow. "They're all foraged from unsprayed, unpruned, unmanaged trees." Even at $20 to $25 per 500ml bottle, most of the 100 cases he and business partner Colin Davis made this fall will be gone within weeks. This is the happy outcome of the Lost Apple Project, which Shacksbury's founders launched last fall after tasting a foraged-fruit cider made by Cornwall farmer Michael Lee. Lee's drink inspired Dolginow and Davis — who market ciders produced in Spain and England while their young orchards take root — to seek out the fruit of Vermont's forgotten apple trees. 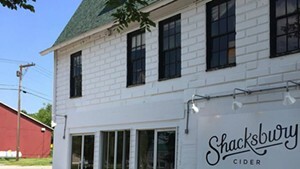 Shacksbury is among an increasing number of Vermont cideries looking to ferment traditional-style ciders using apples grown specifically for the beverage. But since said apples are often sour, bitter, dry and tannic, they fell from favor long ago. 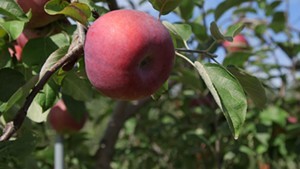 Commercial growers prefer sweeter, juicier apples that can be eaten straight off the tree or used for baking. Orchards are starting to plant more cider-ready fruit to meet rising demand, but, for now, local cider apples are scarce. Luckily, apple trees live a long time, even without human help. Trees that were planted in pastures, homestead orchards and gardens by Vermont's early settlers continue to thrive — but finding them can be tricky. On a cool, late-October day, Davis and a reporter cruise a dirt road in the western shadow of Lincoln Peak, its hillside flecked gold with fall's final hues. "Is this the road I want?" Davis wonders aloud, searching for landmarks. In this section of Addison County, tucked into the hills of Starksboro, Lincoln and Ripton, road signs are rare. Soon, we stop and descend an embankment to a wet recess where weeds and briar bushes entangle a stand of gnarled old fruit trees. Apples litter the ground and a partridge flaps away, then another. Deer and moose tracks crisscross the vale. A dozen or more apple trees grow here. It's unclear whether they are grafted cultivars or mystery seedlings, Davis says. Apples don't grow true from seed — a Snow Apple seed planted does not a Snow apple tree make. Only apples of unlike varieties can pollinate each other to create fruit, which will express endless combinations of genetic material from both parents. But the trees' provenance isn't what matters: Davis and Dolginow are after a specific taste. "Though this was clearly planted," Davis says, "that doesn't mean we want all these apples." He stands beneath a tree hanging with conical, yellow-green fruits that have a pale-pink blush on one side. A bite reveals pungent, slightly acrid but sweet flesh. "We're really looking for fruit that fits the style of the cider we want to make," he adds. With the 1840, Shacksbury is, in effect, curating a cider with floral, spicy, aromatic apples. If an apple seems promising, Davis and Dolginow collect it, press it and taste it once the native yeast turns the liquid from juice to cider. "We'll know in four months if we're really excited about it," Davis says. "The [single-apple cider] might be interesting, but it may not make it into the  blend." If the final mix reflects Shacksbury's meticulous devotion to taste, it also captures the flavor of Vermont's original apples. "Everything we've been picking is completely unique to here," Davis says. Much of the fruit comes from singular trees not grown anywhere else. 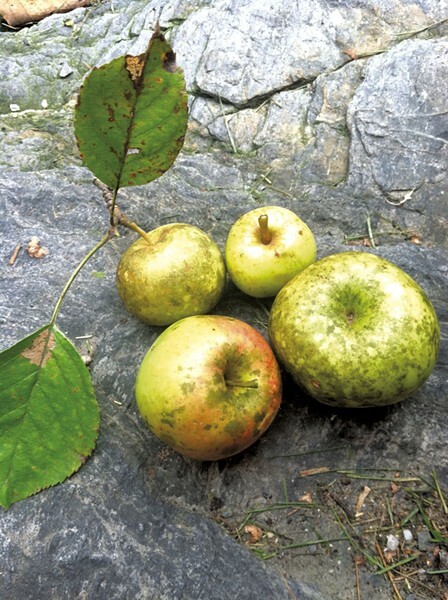 These feral apples create ciders with a sense of place, or terroir. And terroir is as much about a land's geologic history, weather patterns and soil formation as it is anthropological: dependent on how people select and handle their seeds — or grafts — and what they choose to do with the harvested fruit. "It's almost like time traveling," Davis says as we wander the old orchard. "You can taste something that was very important to people here 200 years ago." In the late 1800s, orchards were plentiful in Burlington. "In Vermont's first century, nearly every farm had an orchard," reads a 1932 report from the Vermont Rural Life Commission's Subcommittee on Apples, provided by Vermont Tree Fruit Growers Association executive director Steve Justis. "Apple growing was limited to seedlings of natural varieties, uncultivated and often diseased. 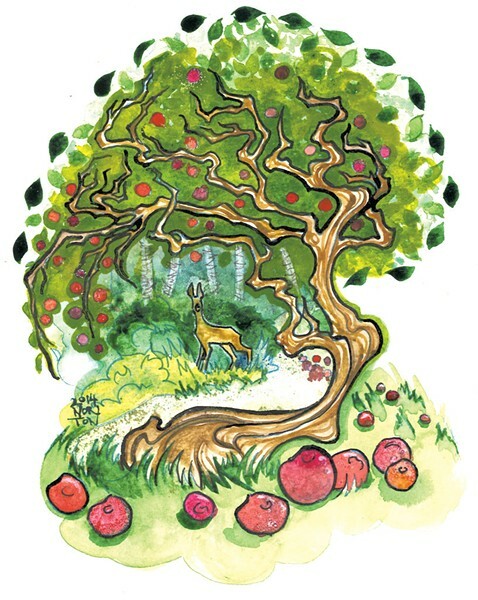 Even so, large quantities of apples were produced — and cider, it is said, flowed more freely than water." As the homesteading days gave way to modern life, fewer Vermonters kept up their orchards, and fewer still made cider at home. With the onset of the temperance movement and Prohibition, hard cider faded from the state's liquid lexicon. But with cider consumption now on the rise, old apple varieties are suddenly in demand. Calais author Rowan Jacobsen just released a book titled Apples of Uncommon Character: Heirlooms, Modern Classics and Little-Known Wonders. In a recent conversation with Seven Days, he likens cider making to winemaking, but notes that if cabernet and pinot noir grapes were suddenly forgotten, they wouldn't survive in the wild for centuries like cider apples do. With the renewed interest in hard cider, he says, "It's this weird hunt to find these masterpiece [apples] we've forgotten about. It's like nothing else I've seen in the food world." Working with his neighbor Terry Bradshaw, a University of Vermont apple researcher (see this issue's cover story), Jacobsen also makes experimental ciders with found apples. Both men are active in Vermont's swelling apple and cider community. Even if they are using fruit from the same trees as early Vermonters, Jacobsen suggests, "We really are making kind of a new drink. Who knows if this resembles what they were drinking back in the 1700s?" In an 1862 essay titled "Wild Apples," Henry David Thoreau praises the seedling apple for its sturdiness and incredible diversity, its sometime fair flesh, and its ability to flourish without man's assistance. Thoreau also describes walking in the type of forgotten-seedling orchards that today's cider makers long to find. "People everywhere want a sense of where they come from," Shacksbury's Dolginow says. "People want meaningful connectivity to the past." Shacksbury is not the only local cidery that's tapping into Vermont's apple history. At Citizen Cider in Burlington, cofounder Bryan Holmes teamed up with local historian Hugo Martínez Cazón to sleuth out apples that famed landscape architect Frederick Law Olmsted once praised as one of the world's finest. "I have eaten a better apple from an orchard at Burlington, Vermont," Olmstead wrote in Walks and Talks of an American Farmer in England, published in 1852, "than was ever grown even in the South of England." The designer of New York City's Central and Prospect parks, Olmsted also created conceptual designs for Shelburne Farms. One particular orchard, at the Adams farm on South Union Street, is thought to be the birthplace of the Burlington Pippin, which was grafted throughout the Champlain Valley. But as the orchards fell to development, the local Pippin was lost to history. Dubbing their pursuit the Olmsted Apple Project, Holmes and Martínez Cazón are hopeful that a few trees remain. "The exciting thing is to try to figure out which of the apples here now are the apples that once were," Holmes says. He's crowdsourcing fruit from Burlington residents — gathered from their yards, the roadsides, forests and meadows — for a one-of-a-kind blend. Holmes says that since he started collecting earlier this fall, he's received about 15 bushels of found apples — in all shapes, sizes, colors and flavors — and he's hoping for more before the November 15 deadline. Citizen Cider's project is more happenstance than Shacksbury's; Holmes welcomes donated apples spanning a spectrum of flavors. 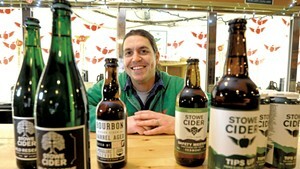 But his goal is to create a special, hyper-local cider imbued with history. Martínez Cazón intends to use Olmsted Apple Project data to map out old orchards, much as Shacksbury's Davis and Dolginow are doing with their Lost Apple Project in Addison County. In both places, the cider makers see apples as a doorway to Vermont's agricultural past. To the extent that history influences terroir, research of this kind is compelling in today's locavore narrative. "There's a lot of focus on food traditions with the whole slow-food movement," says Jacobsen. And apples are especially connected to tradition. "You've got the original stock still here," he points out. "A tree will go 200 years, so the lineage, the link, is unbroken." Apples of Uncommon Character: Heirlooms, Modern Classics and Little-Known Wonders by Rowan Jacobsen. Bloomsbury USA, 320 pages, $35. The original print version of this article was headlined "Pressing Time"